The Aeronautical and Astronautical Association of France (3AF) has signed an agreement with Chile’s Committee for the Studies of Anomalous Aerial Phenomena (CEFAA) to cooperate on the study of UFOs. 3AF posted an article on their website late last month explaining their newly founded relationship with CEFAA. 3AF is an important organization in France, and in Europe’s aeronautical industry in general. Similar to the United State’s American Institute of Aeronautics and Astronautics [AIAA], it is a society for those participating in, or interested in, the aerospace industry. The great Meeting of the Minds about UFOs: 3AF and CEFAA. At this junction I should point out that back in the late 1960s and early 70s, here in the U.S. the AIAA had its own flirtation with UFO sightings, and held one major UFO Symposium. This involved J. Allen Hynek, and (added only at the last minute) Philip J. Klass. I have some of Klass' correspondence about this on my web page on Historical UFOlogy. Since then, the AIAA has been wise enough to avoid the subject of UFOs. I outlined the history and background of CEFAA in the current issue of Open Minds magazine in the article “South American Governments Open New Official UFO Agencies,” which also covers the Uruguayan Air Force project CRIDOVNI and Peru’s OIFAA. A second part covering the recent launching of the Argentinean Air Force commission CEFAE and the official studies undertaken in Brazil and Ecuador will be published in the next issue of Open Minds. It looks like most of South America is currently taking a very proactive official and publicly open effort to tackle UFOs. In May, 2010, the 3AF/SIGMA commission released a progress report. In it, they agreed with the conclusions of the Committee for In-Depth Studies (COMETA) Report of 1999. COMETA was a group of high-ranking retired French military and intelligence officers who conducted an independent study determining that UFOs were real and possibly of extraterrestrial origins. 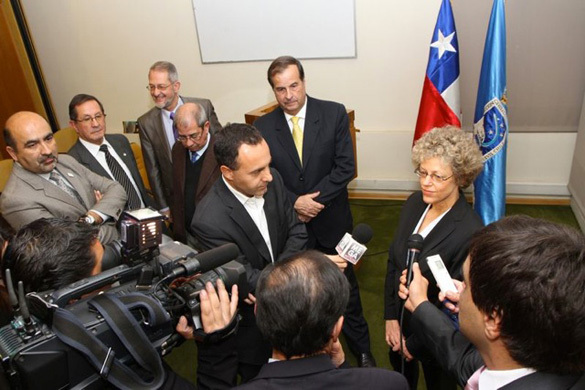 Author Leslie Kean went to Chile twice in 2012 to meet with Generals, Pilots and Government Officials to discuss the Fly UFO Video and other important UFO cases. Before UFO proponents get too excited, let me remind them that Chile's CEFAA was the source of that embarrassing and ridiculous Fly UFO Video that Leslie Kean, author of the 2010 book UFOs: Generals, Pilots, and Government Officials Go on the Record - promoted breathlessly in 2012 as possibly "the case UFO skeptics have been dreading." See my review of her book, ‘Unexplained’ Cases—Only If You Ignore All Explanations. Kean must surely know by now that the famous video from El Bosque shows just bugs. But she won't admit it, giving the excuse that it's a mystery too deep for science to solve. 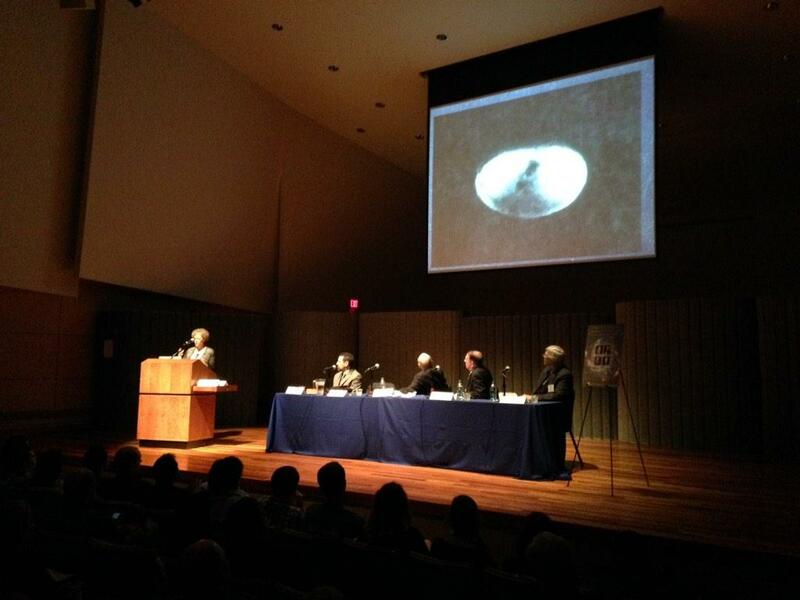 UFO photo analyst Bruce Maccabee says it's just a bug, but Richard Haines of NARCAP says it's a real unidentified. Kean can't admit she was wrong, for it would be too embarrassing to admit that so many Generals and Pilots and Government Officials could be so stupid. And the Fly UFO video is not the only highly dubious piece of "UFO evidence" promoted by the CEFAA. In 2011 blogger Kentaro Omori noted how a UFO photo released by Chile's CEFAA, called by some Chilean UFOlogists "the world’s best UFO photo, " looks amazingly like a reflection of a light in a car window. "As a cooperation between CEFAA and the American NARCAP, Dr. Richard Haines evaluated the series of images and issued a report, translated by CEFAA to Spanish, and also reproduced by Leslie Kean in English." Yep, they found it to be a real UFO. What about that COMETA UFO report written by French aerospace researchers, and endorsed by 3AF? Kean says her initiation into the ranks of UFO proponents occurred in 1999 when she was given a copy of the French UFO report called COMETA, which is usually described as a report commissioned by defense officials, but was in fact written by a private group. Like Bentham upon reading Hume, the “scales fell from [her] eyes,” and she suddenly realized the reality of UFOs as unknown flying vehicles. I'm a skeptic so some people wouldn't trust what I have to say about the COMETA report. But John Alexander is surely no skeptic. He believes in that preposterous UFO incident that Jim Moseley always used to call "Rendle-SHAM," and he's also very big on the phony (and dangerous) Brazilian "faith healer" called John of God." But John Alexander described the COMETA report as “an embarrassment… unsubstantiated data from questionable sources” in his book UFOs Myths, Conspiracies, and Realities. Congratulations, 3AF! You have signed up in an alliance with some of the least-credible UFO buffs around. Once this hits the tabloids (and the UFO shows on cable TV channels), for decades people will think "UFOs" when they see "3AF." Let's take a break from "serious UFOlogy" (like Boyd Bushman's plastic alien, or the Roswell Slides), and take a look at some of the more 'colorful' recent UFO and related claims that you might have missed. We haven't much lately from our friends at Exopolitics, but this one is a doozie. Exopolitician Alfred Lambremont Webre brings us this Important Disclosure Interview: UK Labour Councillor Simon Parkes On Being Brought Up By Aliens. Now I've heard a lot about children supposedly being raised by wolves. It's a good story, but it's not really true. Wolves - canines - raising a human child? They'd eat it, not suckle it. According to legend, the city of Rome was supposedly founded by the half-divine twin brothers Romulus and Remus, who were suckled by a she-wolf. Over the years, there have been many other similar claims. However, this is the first case I'm aware of where a human infant, just three months old, was allegedly suckled by extraterrestrials. Parkes relates what he says are memories of being cared for by a mantid (a praying mantis-like alien) when he was a baby of 3 months. He also has memories of the Garden of Eden, from a previous life, of course. Not surprisingly, it turns out that Parkes is a big fan of David Icke. He says he agrees with about 95% of what Icke says, including the business about the "reptoids." In fact, Parkes says that the Draconis reptoids are the ones that he has "a relationship" with. This is not the man who was seen strolling on Mars. But it is the Viking lander. If she had really worked for NASA, she would have known that there was no such thing as a "Viking rover." It was a Lander, not a Rover. It had no wheels, so it was quite incapable of "running around." As noted by UFO researcher Curt Collins on the Facebook page UFO Updates, UFO SuperStar Dr. Steven Greer took credit for causing the famous Phoenix Lights in one of his interminable "disclosure" talks, back in 2009. "No one knows about this, we have not talked about publicly much," he said, and went on to explain how he had telepathically summoned the aliens. He was flying into Phoenix that night, and his team had made contact with a "huge craft." He telepathically requested the aliens to come into the area, as he was making a video tape to present to the president and the Congress. "We had asked the ETs to cooperate with this effort, to brief Congress, this is what showed up that night." The Phoenix Lights consisted of two separate incidents, the first beginning around 8:00 PM and ending before 9:00, the second beginning after 10:00 PM. He showed images representing both the first and second incidents, conflating the two of them. Both incidents were the result of Air National Guard training flights and exercises from Operation Snowbird, operating out of Davis-Monthan Air Force Base in Tucson, Arizona. "PHOENIX, AZ – Never-before-seen video of the Phoenix Lights was leaked online this week, by KWBV News journalist David Collins. The FLIR video depicts military craft on the night of the mass sighting over Phoenix in 1997." A new video (seen above) has been posted by KWBV News 6 in Phoenix that alleges to be leaked classified footage of what looks like a dog fight between jets and UFOs. The video purports to be from the same day and in the same area as a famous mass UFO sighting in Phoenix in March of 1997. The problem is there is no KWBV News 6 in Phoenix. However, there doesn’t seem to really be a journalist named David Collins as described. Furthermore, although Collins appears to be the only journalist writing for KWBV, his stories are all about him and written in the third person. Rojas found that the video appears to be intended as a viral marketing campaign for a forthcoming movie about the Phoenix Lights. Was The Philae Comet Landing A Fake? Now we learn that not only were the Apollo moon landings faked, but the recent comet landing was faked, too. Comets, says conspiracy theorist Crrow777 are not where we are told they are (?). "Comet" is derived from "coma," which means not only "hair," but also "sleep," indicating that you are being coma-tized by the misinformation. There is no video footage of the landing! Lots of "shenanigans" going on here, folks! 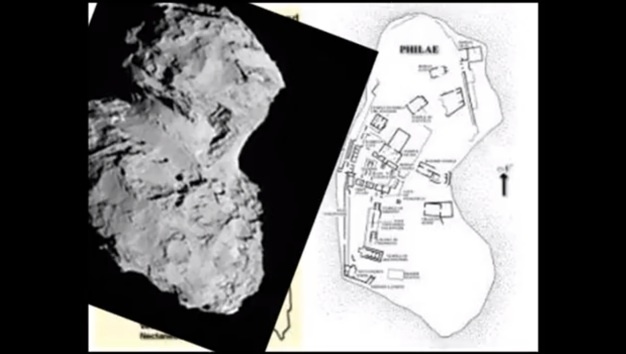 The shape of the comet Philae is the same as that of its island namesake - proof that the photo is fake! Charles Hall, a former US Air Force serviceman claims that the U.S. military have had contact with – and worked alongside – the Tall Whites since the Fifties. In the Sixties, he claims that the ‘shocking’ aliens liked to unwind by donning disguises, including sunglasses, and hitting casinos such as the Stardust, surrounded by CIA handlers. The Vietnam veteran first published his detailed accounts of his meetings with the Tall Whites as a series of four sci-fi novels, Millennial Hospitality – but then ‘revealed’ that they were true. UFO researcher Chris Rutkowski notes that "Charles Hall's casino-hopping aliens were "verified" by none other than Canada's former Defence minister Paul Hellyer, currently the darling of the UFO lecture circuit. " If there were an extraterrestrial in a Vegas casino, it would probably look like this. I wasn't there and there's no video to watch, so I must rely on the accounts of others, especially a report by Michelle Basch on the website of WTOP, the all-news radio station in Washington, DC: "UFO experts say 'we are not alone.' To judge from this, it looks like the presenters forgot that part about appearing "scientific," and spun a lot of wild tales. Best-known of the speakers was Leslie Kean, author of the 2010 book, UFOs: Generals, Pilots, and Government Officials Go on the Record. For those not familiar with the UFO literature, her book is superficially convincing, mainly because of what it ignores: all facts that go against her tidy little picture. To get an idea of what she left out, see my book review, "‘Unexplained’ Cases—Only If You Ignore All Explanations." our analyses have suggested that an unidentified, opaque, aerial object was captured on film at a maximum distance of 10,000 feet. There are no visible means of lift or propulsion and no surface markings other than dark regions that appear to be nonrandom... There is no indication that the image is the product of a double exposure or a deliberate fabrication. While the report [of Haines and Vallee] did look into the possibility of some type of debris on the film or its film plane back-plate was discussed and disregarded, they never looked at the camera itself. The camera system has a very unique optic system that looks very similar to the object in the photograph. Because there were no eyewitness reports from the ground or the members of the mapping team there is not much of a chance of this being an object of approximately 683 feet in size or even something that was an actual object of any size flying in the air beneath the plane. The problem that report had with the object not creating a shadow is easily explainable if the image was created by the optics of the camera and not a physical object below the plane. 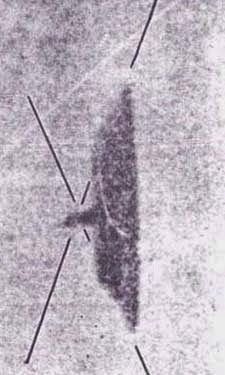 The object in the image appears to have been created by reflections of ambient light inside the optics of the camera system caused by a unique combination of the type of camera system, angle of the plane to the light, position of the sun and possibly the angle of the light coming from the surface of the water located beneath the plane. In other words, this "UFO" is a lens flare, which I think is exactly right. 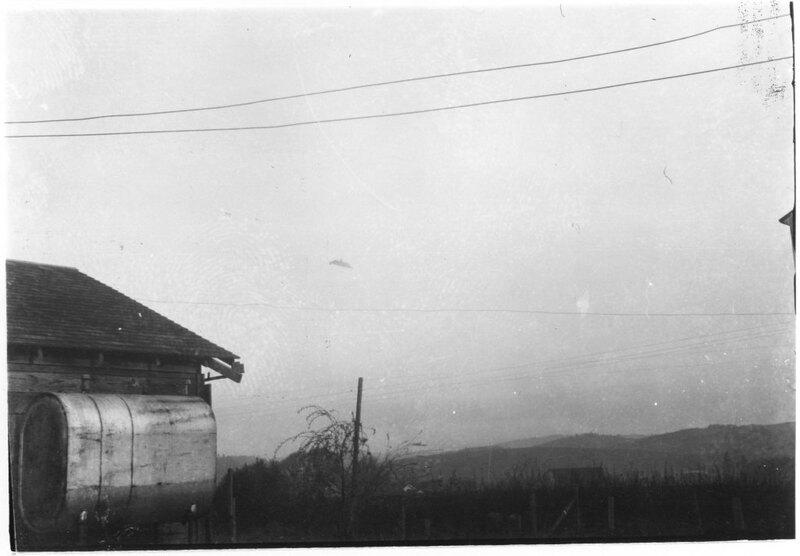 Another "classic" UFO photo which is in Kean's book, and was likewise "authenticated" by Haines and others, but not presented at American University, is the famous UFO photo from Petit-Rechain, Belgium. The man who took this photo, now identified as Patrick Marechal, admitted in July, 2011 that it was a hoax. He said that he has “managed to fool the whole world with a silly model made of styrofoam." Also not mentioned by Kean at AU was her humiliating high-profile promotion in 2012 of a "UFO" in a video of an air show in Chile that is obviously just a fly, under the triumphal banner, "Is this the case that UFO skeptics have been dreading?" Immediately Kean began taking heat about this, much of it from UFO proponents, who were astonished to see how trustingly Kean accepted assurances from Chilean "government officials" (and probably even some "pilots" and "generals") that the Fly UFO video had been studied and authenticated by experts. She traveled down to Chile, twice, to meet with "government officials" and get UFO information from them. It has occurred to me that by oversight I did not report Kean's final statement on the Fly UFO Video on this Blog; here it is. 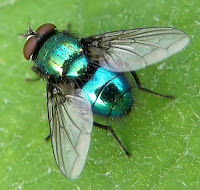 In her Huffington Post article, "Two New Reports on the Chilean "UFO" Videos Produce Conflicting Results," Kean notes that UFO researcher Bruce Maccabee studied the video and concluded that the "UFOs" were indeed bugs. However, Richard Haines (again) proclaimed the objects to be genuinely unidentified. In the end, she concluded that the Fly UFO video was "something that science cannot determine." Science enables us to land a spacecraft on a fast-moving comet millions of miles away, but its methods apparently cannot distinguish a video of an extraordinary flying object from that of a fly. The most riveting presentation of the night came from retired U.S. Air Force Colonel Charles Halt, one of the witnesses of a famous series of UFO sightings in England in 1980 known as the Rendlesham Forest incident. Halt says he went into the forest to check out a report that a UFO had landed there. He saw three indentations in the ground that were spaced evenly, and a Geiger counter showed abnormally high levels of radiation in the area. During this investigation, Halt says, he and several other military members saw a flying, oval-shaped object that glowed bright orange and red, and seemed to be dripping like molten metal. "We're standing there in awe. I said, 'There's got to be an explanation. Ball lightning, or who knows what.' It starts to move. It moves towards us. It comes into the forest. It's moving through the trees horizontally, bobbing up and down as necessary to miss the trees. I'm thinking, ‘Oh boy. I wish I hadn't come out here. This is really getting beyond me.'" He says they watched it for a few minutes, until something happened. "Suddenly and silently, it explodes into five white objects like fireworks, and it's gone." one of the starlike objects supposedly moved overhead and sent down a laser-like beam to their feet. Halt has told this astounding tale in many interviews, but this astonishing occurrence is missing from the [original] memo and tape. Instead, the memo and tape simply refer to the objects as being about 10 degrees off the horizon, nowhere near overhead. In other words, Halt keeps making up stuff to make the story more exciting. Also, Ridpath shows that the "radioactivity" did not measure above the normal background levels, a fact that Col. Halt surely must know by now, but keeps telling as part of his story, anyway. 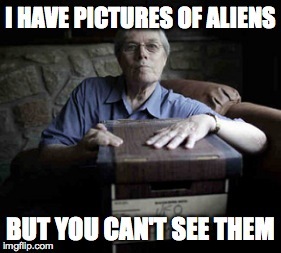 Which brings us to, The Roswell Slides! 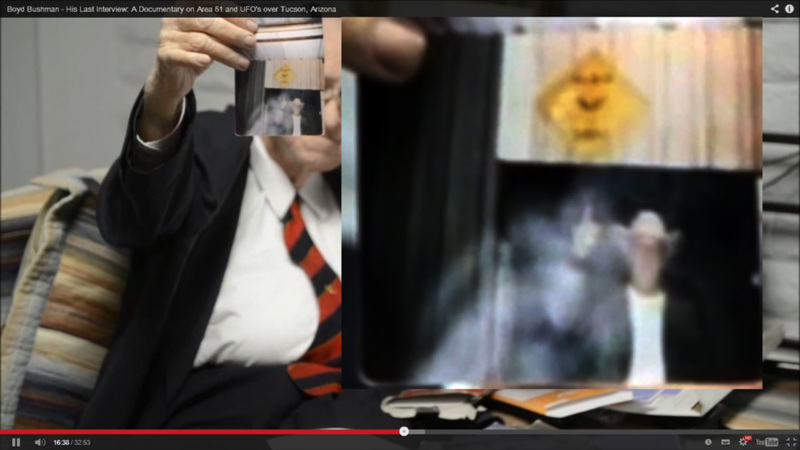 I have not mentioned anything yet on this Blog concerning the controversy that began over a year ago concerning two supposedly newly-discovered slides from about 1947, allegedly showing Roswell aliens that were dissected or something. That's because few have even heard about these alleged Roswell Slides, and nobody has yet seen them, outside of a small circle calling itself the "Roswell Dream Team" (which some suggest is turning into a nightmare). How can you discuss or evaluate something you're not allowed to see? And if you suspect that the "Dream Team" is holding out on the slides for some big bucks media contract, well, then you must have a suspicious nature. And you'd be correct. one of the speakers used the occasion to reveal evidence he called a "smoking gun." "We have come into possession of a couple of Kodachrome color slides of an alien being lying in a glass case," author and researcher Thomas Carey told the near-capacity crowd in Abramson Recital Hall. He's been researching the 1947 Roswell incident since 1991. "What's interesting is, the film is dated 1947. We took it to the official historian of Kodak up in Rochester, New York, and he did his due diligence on it, and he said yes, this filmstrip, the slides are from 1947. It's 1947 stock. And from the emulsions on the image, it's not something that's been Photoshopped like today. It's original 1947 images, and it shows an alien who's been partially dissected lying in a case." Carey says the being looked like what he thought an alien from the famous Roswell incident would look like. "3 and a half to 4 feet tall, the head is almost insect-like. The head has been severed, and there's been a partial autopsy; the innards have been removed, and we believe the cadaver has been embalmed, at least at the time this picture was taken. The owners of the slide -- it's an amazing story. The woman was a high-powered Midland, Texas, lawyer with a pilot's license. We think she was involved in intelligence in World War II, and her husband was a field geologist for an oil company." Carey says he plans to reveal the images early next year. Obviously the Roswell Slides is rapidly turning into one of those periodic mega-controversies that tears UFOlogy asunder. Already, an obviously-agitated Billy Cox, replying to Carey, is demanding "now let's see them pix! ", and he compares the matter to the now-infamous alien autopsy hoax of 1995. The famous Alien Autopsy hoax. Now the Roswell Slides are being reported in the tabloid Daily Mail in the UK, and from here it's off to the races. Unsourced but obviously based on the WTOP report, The Mail quotes Carey's sensational "smoking gun" claims made to the American University audience. 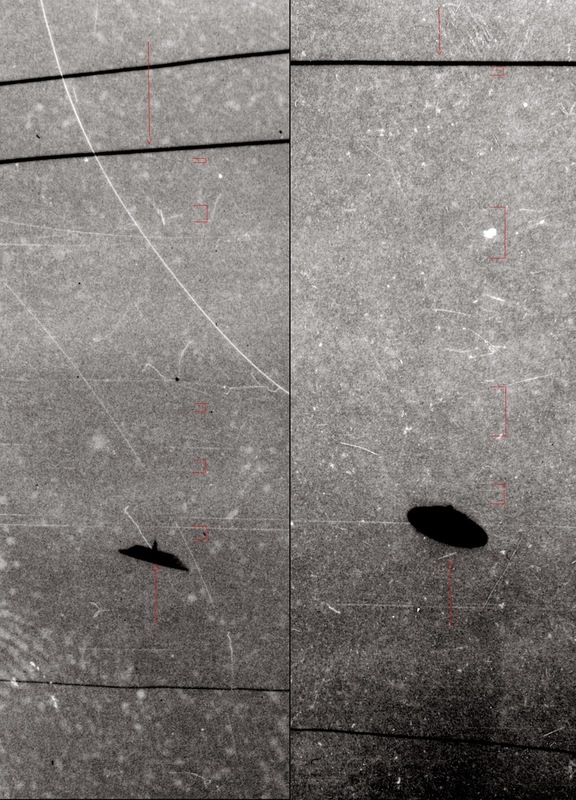 Gratuitous alien image accompanying the Daily Mail story on the Roswell Slides (from YouTube video "Grey Alien - Teil 2von2", http://www.youtube.com/watch?v=9zQ3Okm9ipY). So, did the UFO seminar at American University succeed in creating a "crack in the wall" to allow 'UFO truths' to trickle out? The conference organizers had full control over the viewpoints presented - nobody was invited who might dissent from Leslie Kean's Party Line. After ten days, the result was exactly one (uncritical) news media report on the panel, and a few obscure Blog postings. Had there been anyone on the panel who might have presented a dissenting view, such as you find here, the panel's facade of 'objective scientific UFO research' could not have been maintained. And since it has now been widely noted that one of the panelists, Tom Carey, went full Monty into "smoking gun" UFO fantasyland, it's a safe bet that the people at American University will soon wish that they had never opened this Pandora's Box. Dr. James E. McDonald (1920-1971) was a noted atmospheric scientist at the University of Arizona in Tucson, but today is best known for his tireless advocacy of UFOs. More controversial than most UFO advocates, McDonald's methods were confrontational, and he did not get along well even with many who shared his beliefs about UFOs, like J. Allen Hynek and Jacques Vallee. McDonald came under intense scrutiny and criticism from arch UFO skeptic Philip J. Klass, who not only criticized inconsistencies in McDonald's statements, but accused him of mis-using funds from his government contracts to conduct his UFO research (which criticism turned out to be substantially correct). This has led to irresponsible suggestions that Klass virtually 'hounded' McDonald to his tragic suicide. As we will see below, McDonald's suicide didn't have anything to do with Klass, or UFOs. Now, thanks to researcher John Greenwald, Jr., the FBI's files on McDonald released to Greenwald are now available on Greenwald's on-line repository of declassified government documents, The Black Vault. Interestingly, we see the FBI expressing little interest, and no concern over McDonald's involvement with UFO claims. Remember, these FBI papers were secret at the time they were written, and nobody expected them to someday be released. If a government UFO coverup existed, we'd expect to find statements like "He's getting too close to learning our secrets, we must stop him." However, we see that the FBI was concerned over McDonald's minimal contact with someone (whose name is redacted) known to have involvement with Soviet intelligence (see pages 6-9). They apparently concluded that it did not mean much, but were interested to check up, anyway. During the cold war, it was not at all unusual for Soviet "diplomats" or scientists in the U.S. to make contact with leading American scientists and engineers, to potentially learn as much as they can about the latest developments in U.S. science and technology. Philip J. Klass told me of being approached I believe twice by such individuals, and this is reflected in Klass' own FBI files. [redacted; obviously an FBI source at the U of A] said that he has no doubt whatsoever of the subject's loyalty to this country. He said he feels certain the subject's contact with the Soviet representative at the UN Secretariat in mid-1968 in connection with the subject's "UFO studies" was completely innocuous... At this point it does not appear that an interview of Professor MCDONALD would be productive and could possibly result in embarrassment to the Bureau. It appears that Professor MC DONALD's letter to [redacted1: probably the Soviet representative at the UN] (contents of which are not known) might have been in itself an innocuous, sincere contact on the part of Professor MC DONALD; however, in view of his background and [redacted2] long time leadership in "New Left" activities in the Tucson area, it is quite probable that Professor MC DONALD would be highly susceptible to an approach made by a Soviet intelligence, particularly concerning a research done in his field, of atmospheric physics. This was the height of the Vietnam War, and while most anti-war protests were peaceful and perfectly legal, at least some groups were bent on fomenting violence and revolution. And these groups were being watched very closely by the FBI. In October 1968, [redacted: obviously Betsy McDonald] reportedly attended the SDS National Convention in Boulder, Colorado, and was overheard telling a group in Tucson upon her return that she favored violence, if necessary, to achieve the goals of the SDS. In all likelihood, "redacted2" refers to what I heard from J. Allen Hynek soon after McDonald's suicide - that McDonald's wife had been having an affair - and he took it extremely hard. This is more than two years before McDonald's suicide. Obviously, his marital difficulties had been brewing for some time. Applicant-type investigation of subject in 1962, favorable re loyalty, character, and reputation. Subject's wife is active in Students for a Democratic Society and peace movement. Subject is disenchanted with [redacted: probably "his wife's"] "New Left" activities and separation planned. Jim plunged into his research: UFOs, effects of supersonic transports on the atmosphere, the possible destruction of the ozone layer... He did it out of despair, with no humor, no ability to distance himself from what he was studying. Jim had even researched his own case very scientifically, as he did everything: He had gathered detailed statistics about suicide. Other papers hint at other problems the FBI had with McDonald (p. 44-63). Apparently he had signed a petition in 1961 of the Fair Play for Cuba Committee (soon to be made notorious by one of its zealots, Lee Harvey Oswald), protesting the U.S. "hostility" to Cuba, and calling for an end to the trade embargo (p. 67). McDonald was also involved with the ACLU, which the FBI apparently considered a subversive organization. Worse yet, he had been a public critic of the Air Force as far back as 1959, concerning its placement of ICBM sites near Tucson. He claimed this placed civilian populations in unnecessary danger in the event of war. One thing that was not found in the McDonald FBI files: any reference whatsoever to Philip J. Klass. Boyd Bushman of Tucson, Arizona said he was a retired Senior Scientist for Lockheed Martin, whose career spanned over forty years. (However, his alleged connection with Lockheed Martin has never been demonstrated.). Shortly before he passed away on August 7, 2014, he made what is being called a 'deathbed confession' relating his alleged experiences with Area 51, UFOs, aliens and anti-gravity. The video of Bushman's UFO claims had been played well over 1 million times on YouTube, before it was removed because of copyright infringement claims by one "Chris Mooney." (Not the same Chris Mooney who writes about conservatives' supposed "War on Science," yet ignores the liberals' War on Science - anti-GMO, anti-vaccines, etc.) We don't know who this Mooney is. The 32-minute video turned up a few other places on YouTube, but was also removed. You can see part of his video here. some UFOs and Aliens are stationed at the base. He explains that from space there is a special flight path to Area 51. The aliens who are working at the base are about 1.5 meters long and up to 230 years old. They have five fingers, which are 30 percent longer than ours, and five toes, which stuck together. They have three ribs on each side and three vertebral columns. The aliens communicate through telepathy. Finally Bushman reveals that Area 51 is working together with the Russians and the Chinese and their research is mainly focused to anti-gravity. Bushman also claims that in 1947 a U.S. Air Force pilot shot down a flying saucer over New Mexico, killing several aliens. The military, of course, recovered the craft. Most interesting are all the photos, supposedly of UFOs and aliens that he claims his friend took at Area 51, using a camera he provided. In fact, Bushman claimed that his camera was given to the aliens, who obligingly took photos out the window during a UFO trip, then returned his camera (although it's doubtful that the aliens, traveling so much faster than light, could actually see anything). Weirdest of all is a "spirit photo" that supposedly shows the ghost of an alien that died. However, as soon as Bushman's video was posted on the popular UFO site The Black Vault, others began submitting photos and even a video of seemingly-identical aliens, albeit plastic ones. YouTube commenter Eric Oulette provides this photo of a toy alien looking very much like Bushman's. Another reader submitted this photo of a toy alien purchased at the K-Mart. YouTube user John Hutchison (JonnOfMars) posted this video showing a toy alien he purchased several years back. Hutchison was involved with some of Bushman's earlier videos, so this "coincidence" cries out for explanation. However, not everyone was willing to accept that Bushman's Close Encounter was of the Plastic Kind. Perhaps the plastic aliens are accurate representations of the real ones? Some have even suggested that the toy alien could be intended as a step toward 'disclosure' of real aliens: "Who knows how and to whom these things are revealed?" Bushman's involvement with Lockheed Martin has, of course, again raised the old canard that Ben Rich, former director of the Lockheed Skunk Works (developers of highly-classified secret aircraft) supposedly said in at least one of his lectures that "We already have the means to travel among the stars, but these technologies are locked up in black projects, and it would take an act of God to ever get them out to benefit humanity... Anything you can imagine, we already know how to do." This quote, however, has never been authenticated. Researcher Curt Collins goes into such claims in detail in two postings on his Blog Blue Blurry Lines (First. Second). Aviation historian Peter Merlin has the full story in his account in Tim Printy's Sunlite E-zine (Vol 5 nr. 6, p. 17) In brief, it seems that Rich liked to make jokes about ETs in his lectures to entertain his audience, such as "The Skunk Works has been assigned the task of getting E.T. back home." Anyone taking such comments seriously has completely misunderstood their context. Special Report: The Trent UFO Photos - the "Best" of All Time - Finally Busted? 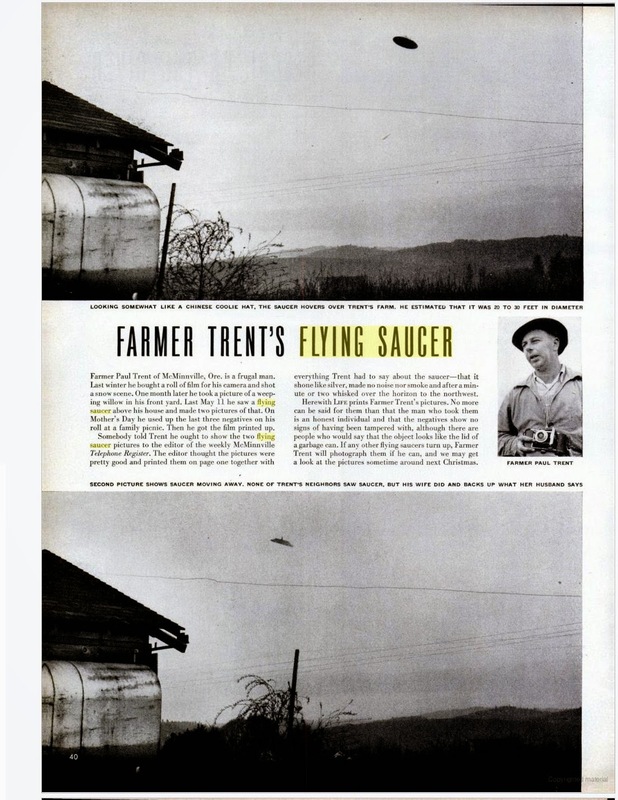 Once again, farmer Paul Trent's famous UFO photos from McMinnville, Oregon are a hot topic in UFOlogy. Kevin Randle discussed the photos on his Blog A Different Perspective, and a torrent of comments from researchers followed. Not just frothy opinion, but highly detailed, meticulous comments about the camera angle and position, the weight and size of the hypothetical model, the load on the wires and a possible bend in them, etc. Ultimately this is important, but such matters are unlikely to give us a final answer. There is one thing about this case that everyone can probably agree with: as Randle says, "there are only two conclusions to be drawn about the pictures taken in McMinnville, Oregon. They either show a craft from another world, or they are a hoax. I do not see a third possibility." 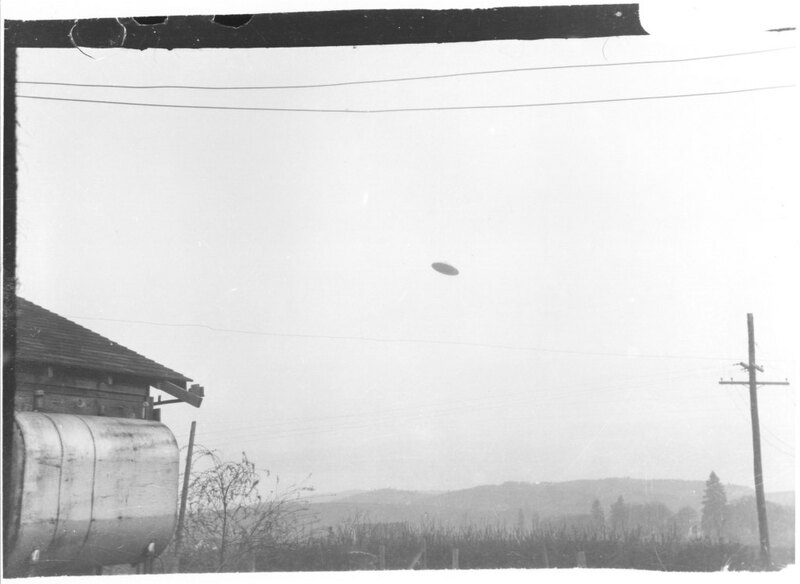 On May 11, 1950, farmer Paul Trent of McMinnville, Oregon snapped two photos of an object that he claimed was a flying saucer (the term "UFO" hadn't been invented yet). There are inconsistencies in Mrs. Trent's accounts of where her husband was when the object was first spotted, and who went inside to get the camera. They did not immediately tell anyone about the photos, or rush them off to be developed. 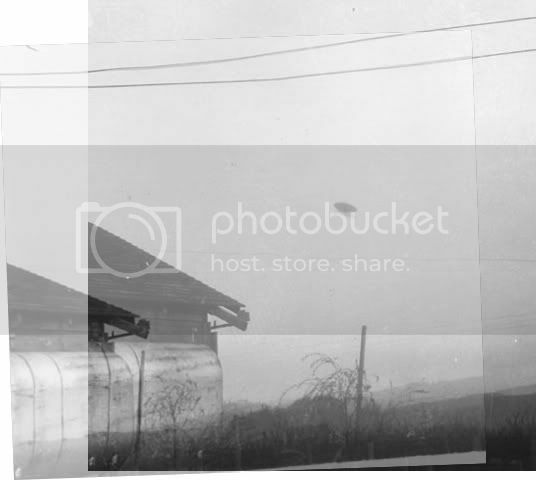 Instead, the film containing the invaluable flying saucer photos was left in the camera until Mother's Day, so that a few unexposed frames would not be wasted. More general information on the photos is on my web page http://debunker.com/trent.html . After the photos had been developed, a reported who came to interview the Trents found the irreplaceable negatives lying "on the floor under the davenport, where the Trent children had been playing with them." The story first appeared in the local newspaper the Telephone-Register. This led to a sensational national story in the June 26, 1950 issue of Life Magazine, then one the largest-circulation magazines in America. Life Magazine article. Photos are cropped, removing wires. The famous (and to some, infamous) Condon Report included the Trent Photos in its section of Photographic Case Studies as Case 46. The principal investigator was William K. Hartmann who, incidentally, was the first person to come up with the presently-accepted theory about the origin of the earth's Moon. 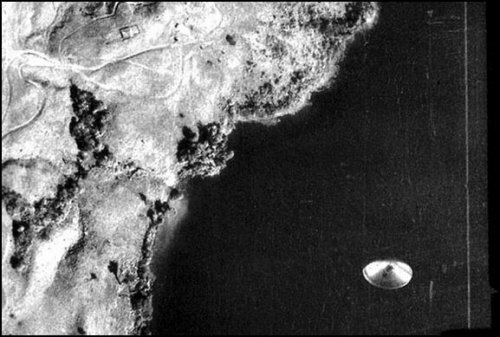 This is one of the few UFO reports in which all factors investigated, geometric, psychological, and physical appear to be consistent with the assertion that an extraordinary flying object, silvery, metallic, disk-shaped, tens of meters in diameter, and evidently artificial, flew within sight of two witnesses. It cannot be said that the evidence positively rules out a fabrication, although there are some physical factors such as the accuracy of certain photometric measures of the original negatives which argue against a fabrication. The object appears beneath a pair of wires, as is seen in Plates 23 and 24. We may question, therefore, whether it could have been a model suspended from one of the wires. 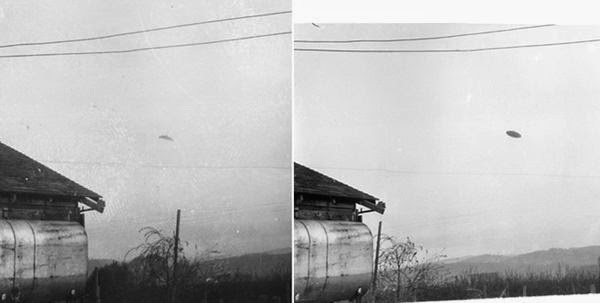 This possibility is strengthened by the observation that the object appears beneath roughly the same point in the two photos, in spite of their having been taken from two positions. This can be determined from irregularities, or "kinks," in the wires. The wires pass between the camera positions and the garage (left). We know from the change in orientation of the object that it moved, or was re-oriented by hand, between exposures. The possibility that it is a model hanging beneath a point on the wire suggests a further test: Is the change in distance of the object in Plates 23 and 24 equal to the change in distance from the wires? Measures of the disk indicate that it is about 8% further away in Plate 24. Measures of the irregularities in the wires indicate that they are further away from the camera in Plate 24. The amount of the latter increase from the wires (measured by the separation of rather ill-defined "kinks") is less certain than the distance increase from the disk, but it is measured to be about 10%. These tests do not rule out the possibility that the object was a small model suspended from the nearby wire by an unresolved thread. The sole factor suggesting that the object is distant is a measured anomalous brightness on the underside of the object in Photo 1, compared with the brightness of the shaded underside of the oil tank. The assumption is that, in the case of a model, the two shaded regions ought to have about the same brightness. Since the underside of the object is brighter than the underside of the tank, the assumption is that atmospheric scattering is the cause, and hence the object is at a significant distance from the camera. When I read this, I immediately thought of at least one other possible explanation for the anomalous brightness. When observing bright stars or planets in telescopes, we invariably see light scattered by the optical system from bright objects into adjacent dark areas. The same thing happens in cameras. The technical term for this is veiling glare. The cheaper the optical system, the more light that tends to get scattered, and Trent's camera was a budget model, not professional quality. This is especially troublesome when fingerprints or other smudges accidentally get onto the lens, which certainly happens to me, and probably to most other people. The significance of this is that while the dark underside of the object is immediately adjacent to the bright sky, the bottom of the tank is in a large, dark area of the photo. Hence one would expect more light from the surroundings to spill over into the bottom of the "UFO" than into the bottom of the oil tank. I was an undergraduate at Northwestern at this time. I decided to test this hypothesis by photographing a concrete light pole in the daylight, with the top of the pole surrounded by bright sky, while its bottom was against a much darker background. I found a professor who had a densitometer in his lab, and would show me how to use it. I measured a series of photos and, while the top of the pole was only a little brighter than its bottom with a clean optical system, the addition of just a little petroleum jelly to degrade the optical system greatly increased the amount of veiling glare - spilled-over light - in the photos. If the object is translucent, allowing light from the sky to pass through. the object has a mirror surface at the bottom, thus we are seeing a reflection of the bright ground, and not a shaded surface. Very sharply defined shadows in both photos - obviously cast by sun. The angle abc above represents the radius of the illuminating body. Assuming these measurements, it is the arctangent of .004, which is 0.229 degrees. This matches extremely well with the known average apparent radius of the sun, which is approximately .25 degrees. Even an undetected reduction of 20% in the size of the shadows in the photo, which is highly unlikely, allows the radius of the illuminating body to be no larger than 0.46 degrees (diameter 0.92). The maximum possible diameter of the illuminating body is thus shown to be less than one degree, and is probably closer to one-half degree. The area of a one-degree circle is less than 0.025% (1/4,000) that of the quarter sky facing the garage wall. A bright cloud in full sunlight is only about 10 times the surface brightness of the sky surrounding it. Furthermore, during and after sunset, the sunlight in the landscape has traveled a very long path through the atmosphere, and has thus been very evenly scattered and diffused. According to the astronomer M. Minnaert, by about 10 minutes after sunset, the sky and landscape in the east is dull and of uniform hue. Even a half-hour before sunset, clouds in the east assume a dull red color. To attribute the illumination in the photos to a bright cloud, or to a bright hole in the cloud cover, especially after sunset, would require a surface brightness of these remarkable clouds on the order of magnitude of thousands of times that of the surrounding sky, which is inconceivable. It is particularly implausible that such illumination could exist around the time of sunset. Conclusion: Because of the small maximum angular size of the illumination body and its intense brilliance, there can be no doubt whatsoever that the shadows in the Trent photographs are cast directly by the sun. Maccabee still maintains that the shadows on the garage were cast by a bright sunset cloud, even though the McMinnville weather station recorded perfectly clear skies at 7:00 PM on May 11, 1950 (the last observation of the day). His illustration of that argument is below. I have seen and photographed such clouds myself, I am not saying that they do not exist. However, look at the board Maccabee sets up to try to replicate the shadow of the eaves on the Trent garage. The board casts a decent shadow for a few inches below the point where it touches the wall, then as the board moves slightly farther from the wall, the shadow quickly fades to invisibility. At the point where the shadow disappears, at the top of the support pillar, the board is only 8 inches or so from its shadow. The end of the eaves on Trent's garage were approximately twenty inches from the wall (I measured this on a building of similar construction), yet the shadows are still sharp and distinct. This is because they were cast by the sun, small and very bright, not a large, diffuse cloud. If Maccabee can find a sunset cloud that can cast sharp shadows of such boards at twenty inches, then I might be prepared to accept his argument. Maccabee's illustration of a bright cloud casting a shadow at sunset. But the shadow is too diffuse to allow it to be seen when the board casting it is some twenty inches from the wall. In 2004, researcher Joel Carpenter (1959-2014) created a website on the McMinnville photos, making a very good case that the object was directly beneath the overhead wires, and close to the camera. He suggests that the object was a mirror from an old truck. I have restored Joel Carpenter's original McMinnville photos website (fixing only the links), and placed it on the Internet Archive. Instead of moving toward the object and shooting the photos from eye level in the unobstructed front yard, he shot the two photos up, from a very low level, from the back yard. For reasons explained above, it seems likely that he actually used the viewfinder on the body of the camera while kneeling. The overall geometry of the positions and the attributes of the camera suggest that he was attempting to frame a nearby object in such a way as to maximize the amount of sky around it and enhance its apparent altitude. In other words, Trent walked away from where the UFO was supposed to be, and instead walked toward where the presumed model was hanging from the wires, and crouched down close to the ground to make his "UFO" appear distant. This is another cross-eyed stereo pair. That means you need to back away from the monitor a little bit, cross your eyes, and try to line elements up in each picture until you get them together and in focus. Try it first with the oil tank. That has been shrunk to size and aligned to make it a little easier. Now just for the hell of it, line up the saucer. It won't be exact, because they're at a different tilt in each photo, but do what you can. Got it? Now "look up" at the overhead wires. Curiously enough, they line up at the same relative distance as the saucer! That's interesting, don't you think? And if you look around the image, as well as the other available images of the yard -- the ones with the ladder -- the wires are not far away at all, but are actually closer to the camera than the oil tank. So if the UFO saucer lines up at that point, then there's a pretty good chance that the UFO is actually pretty close to the camera, also. Well, certainly the UFO could have moved and somehow by pure chance managed to get a stereo separation of exactly the same distance and at the same relative angle as the overhead wires. That would be amazingly coincidental, wouldn't it? The Trent photos as a stereo pair, by "Blue Shift" on ATS. The "UFO" is seen to be small, and relatively close. Another way of demonstrating the same thing: a montage by David Slater demonstrates that when the two Trent photos are overlaid so that the wires are lined up, the images of the “UFOs” line up as well. Both these demonstrations show that the “UFO” appears to be fixed with respect to the overhead wires. The Trent photos overlaid, by David Slater. "UFO" and wires all line up! 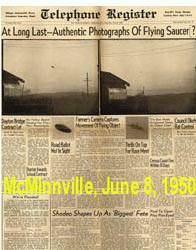 In 2013 a group of French skeptics (IPACO) did an in-depth investigation of the McMinnville photos. They began with the usual description of the line of sight to the object in each photo, presumed suspension methods, etc. They concluded that the object is a small model. The basic idea is that if there are traces of a thread in a picture’s pixels, above an object hanging from this thread, and if this trace is « buried in noise » within the sky’s background (noise due to atmospheric diffusion and/or to the digitizing process), it should be possible to increase the signal-to-noise ratio thus uncovering the thread, by summing pixels along columns parallel to the thread. They concluded, "For the TRNT1 picture, the presence of a negative peak (thread darker than the sky) was clearly observed which matched exactly to the supposed attachment point, with a significant difference of 2,38 sigma, for a tilt angle equal to -11°.... Application of the same method to the second picture TRNT2 provided comparable results, with a tilt angle of -10.29 ° and results of over 2.5 sigma." A) nearly everybody else who has investigated the question has come to the opposite conclusion, including William K. Hartmann and Claude Poher. The IPACO report says "The relative position may obviously be considered as nearly constant, which can only be explained, from a geometric point of view, if the object was effectively hanging from the wire OR if its movement between both shots was following precisely its sighting line." B) The IPACO report based their measurements largely on a map provided by Maccabee. "These French debunkers have incomprehensibly asserted that the UFO and wires are "black bodies" to which they apply "radiometry" -- which is the science of measurement of heat. They claim to derive an estimate of distance from this. They apparently have no idea what they are talking about.... They have confused photometry (light measurements) with radiometry (heat measurements from black body heat radiation, thermal emissions)." Technically, he is correct. However Sparks does not consider the possibility that the problem is simply the result of a bad translation from the original French. If you read the paper, it is obvious that they are using the word "radiometric" to mean the brightness of the pixels, and not any supposed heat emitted by the object. Their measuring technique is valid, even though the English description of it isn't. If the "French Debunkers" had substituted the proper word "densitometric" for "radiometric", and "dark bodies" (meaning, opaque and not self-luminous) for "black bodies" (which has a very specific meaning in physics), the objection vanishes. Now, another researcher has weighed in. Jay J. Walter of Phoenix, Arizona, the author of the suspense horror novel Blood Tree, did his own investigation. Working from high-resolution scans of first-generation prints that I sent him (scans now posted on the Internet Archives for anyone to research), he did his own photo enhancement using the venerable program ArtGem. He said that even using a 4.2ghz quad core 64bit processor with 8 gigs of system RAM, he was still getting "out of memory" errors. However, he persevered, and produced the following photos, appearing to detect portions of a suspension thread above the object in both photos. The purported string cannot be seen across its entire length, which is consistent with the French skeptics only being able to detect it statistically. It is significant that Walter and the French team were working with different scans. Jay J. Walter's possible detection of a suspension string in the first Trent photo, its position illustrated by the drawn-in string in the bottom photo. Walter's suggestion of a string in the second Trent photo. I had to convert these photos from TIFF to JPG format in order to post them, which loses some details. Walter's apparent string seen in its proper orientation. 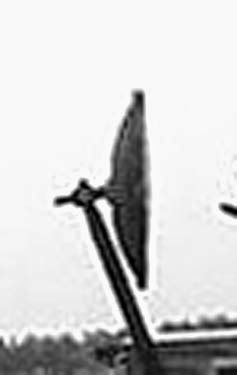 Another of Walter's purported discoveries is what he calls a "logo," an apparently flat area with two holes, where it appears a logo plate might be attached, or possibly even a handle. Is this real, or is it simply "pareidolia" - seeing a pattern where none exists? Confirmation is needed. Did something once attach here to the object in Trent photo #2? Walter suggests that the object in question is an appliance motor shroud, approximately eight inches in diameter. "I think Trent walked to the garage one evening, tied a string to an appliance motor shroud via an old bolt, tossed the shroud over a wire and tied the other end of the string to an anchor near the ground, then took the two pictures. Logical, practical, and so much less effort for him than other theories. People just do what they do and Trent wasn't going to go to too much effort just to fool his banker buddy." But wait - there's more! In the words of UFO researcher Martin Shough on UFO Updates, "I am hearing rumours that certain researchers, one of whom is no stranger to this List, are on the brink of publishing an analysis which they believe is proof of a hoax. I have it on the authority of a third party - a 'usually reliable source' - that cunning digital enhancement has revealed the presence of a string or wire support." I have been in contact with this Mystery Researcher, who has not authorized me or anyone else to reveal his findings. He was planning to write a book exposing three major UFO photo cases as hoaxes, one of course being Trent. However, he says this plan has been abandoned, and he is uncommunicative about the details of his work. I do not have proof of what he says about the string. However from the seriousness with which he has undertaken other investigations, I am inclined to believe that he has indeed found it. Do these new findings finally debunk the Trent photos? They would, provided they can be independently confirmed by other researchers, using other high-resolution scans from first-generation prints, or else the original negatives. Until then, people will continue to argue about such matters as the gauge of the wires, and whether the model, if it were a model, would have to be five or six inches in diameter.